From tiny bathrooms with bold personalities to large minimalist ones, we’ve got them all. 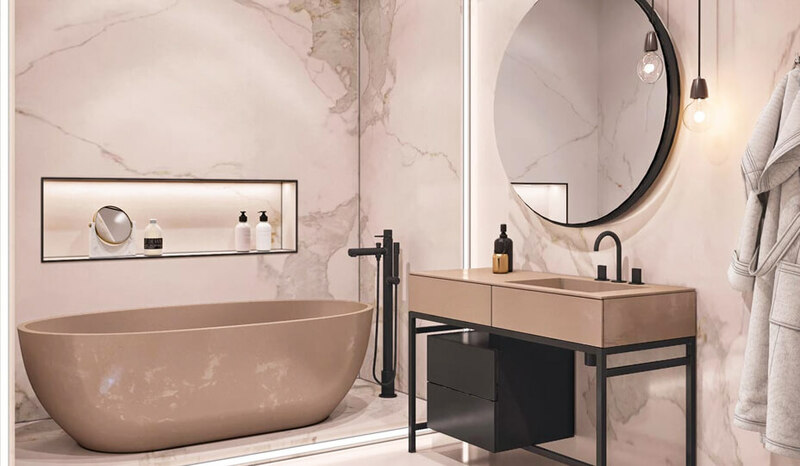 Whether you’re looking to make some small changes or completely remodel your bathroom, you should definitely check out these 50 bathroom designs. Our 360° Verified Contractors will know how to make your dreams a reality. Browse through these great bathroom designs to get started. Bathrooms with big windows are quite unusual. The designer was bold in choosing to surround the freestanding tub with not one, but three massive windows! The black frames contrast magnificently with the room's white walls - creating a dramatic effect. 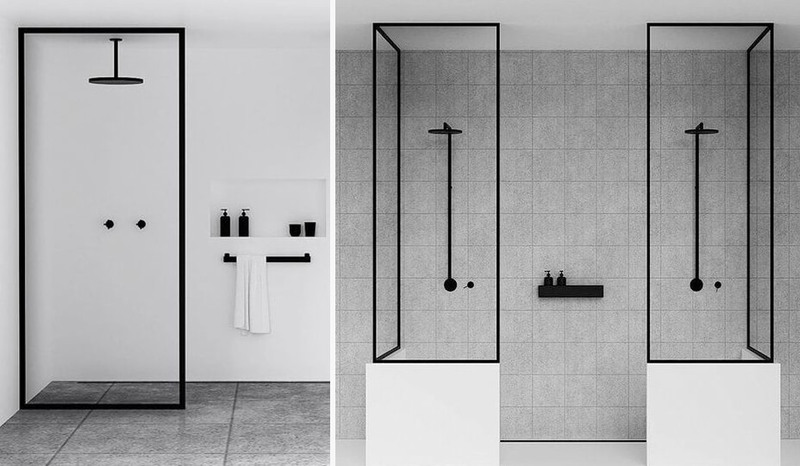 A minimalist bathroom does't need to be boring! 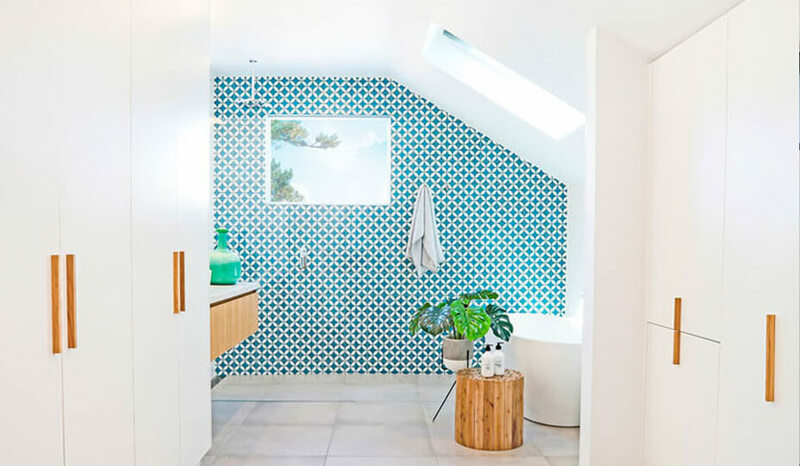 This Scandinavian-styled bathroom surely has a lot of personality with its bright blue floor-to-ceiling tiled wall! The light wood vanity also adds some warmth to light coloured bathroom. It's definitely not space that's missing in this reimagined shower! Its design is simple and practical, with a 3-shelved shower cubbyhole right in the middle. This massive walk-in shower also includes a large bench where you can sit back and relax! Small bathroom's can be interesting! 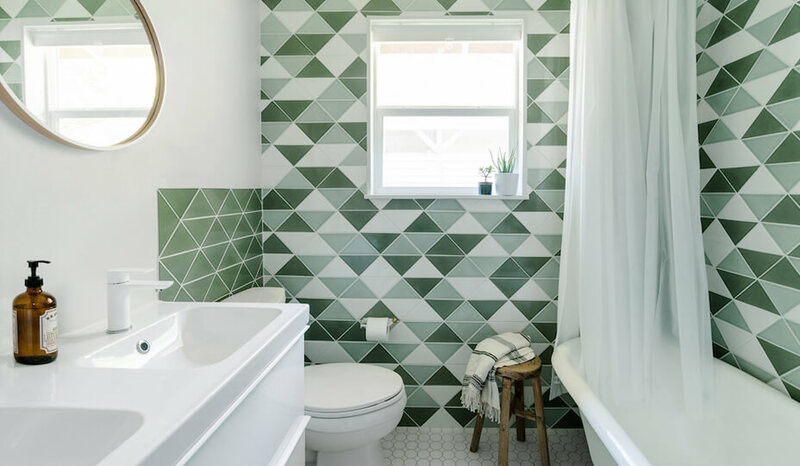 The green geometric tiling is surely the highlight of this room. Paired with some honeycomb tiles on the ground, the two shapes are atypical together. The daring tile choice paid off - delivering a beautiful bathroom! Architectural lighting, white walls, a floating vanity and oval mirrors are the perfect combination to create a sleek futuristic bathroom. The curved lines of the faucets and the tinted glass add a unique touch to the room. Wallpaper is the perfect way to add liveliness in a small bathroom or powder room! 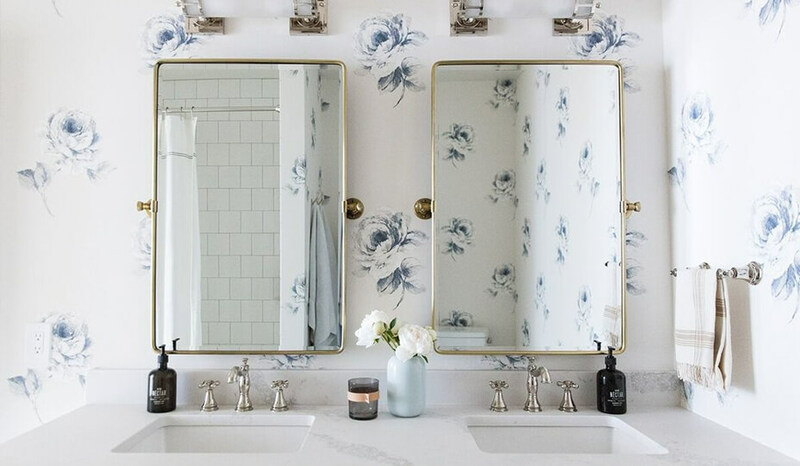 This bathroom features a delicate - and feminine - blue flower pattern on its wall, adding personality to the room. This bathroom certainly doesn't lack charm! The black molding combined with the green floral wallpaper adds character to the little room. Every detail in this bathroom is unique, from the gold light fixtures to the open marble vanity. This bathroom will definitely turn heads! We are often afraid to put dark colours on our bathroom walls, but it's a inexpensive way to give a dramatic effect to any space. 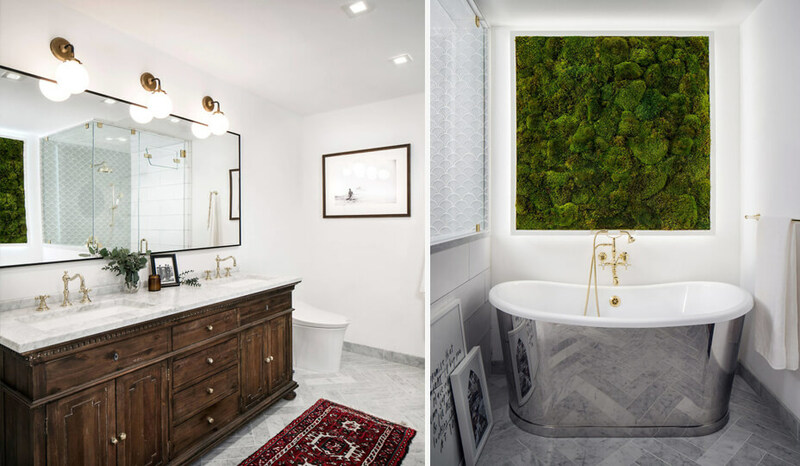 The rich green enhances the abstract art piece, while the gold fittings perfectly match the bathroom's character. 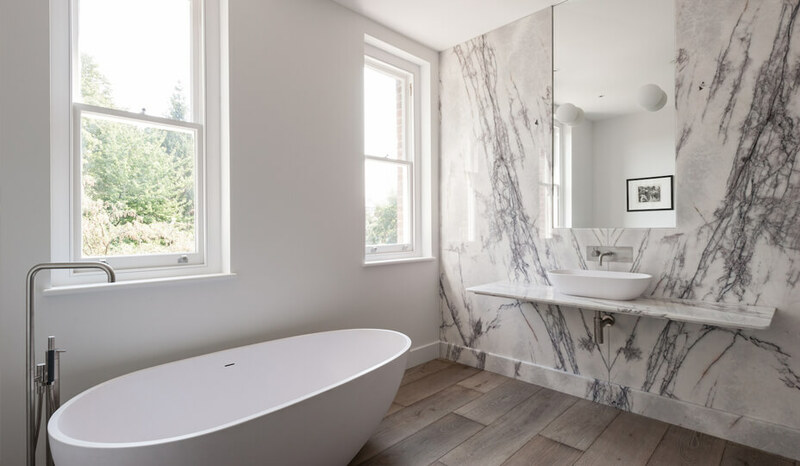 A definite WOW factor: Adding a massive marble wall with a seamlessly mounted mirror! This bathroom is both luxurious and minimalist - where only the essentials have been installed. 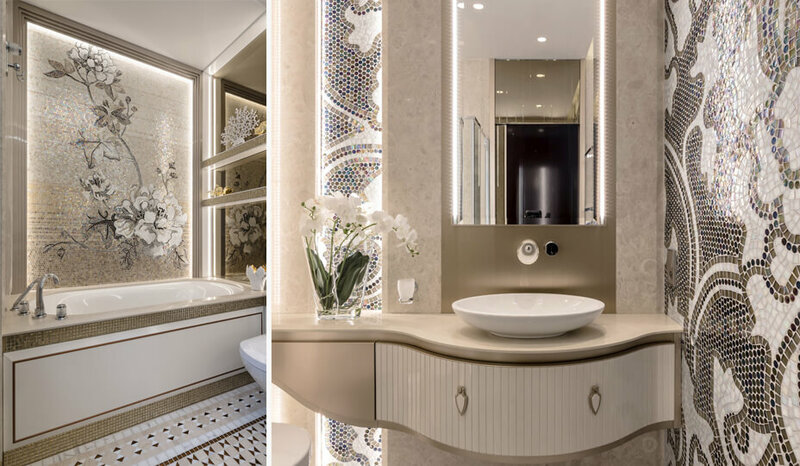 This opulent bathroom isn't only elegant, it's functional as well! Every aspect of the room is quite detailed - from the textured wall to the marble countertop. The vanity mirrors also have built-in architectural lighting & the vanity itself has tons of storage space. Installing a bathroom in an attic can be challenging! 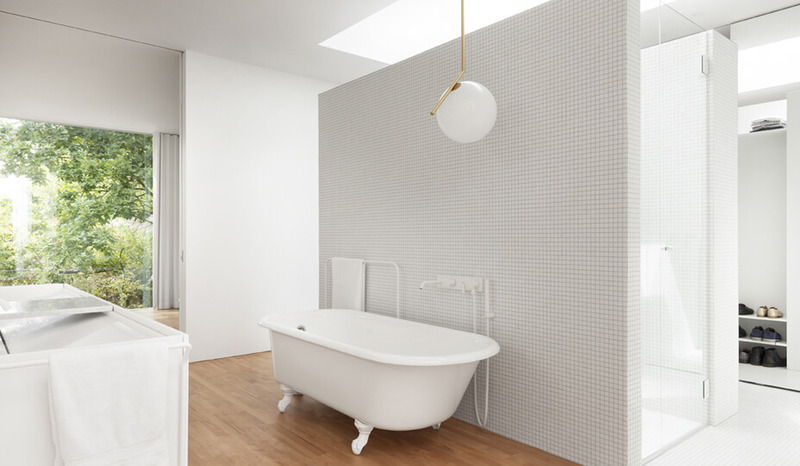 Though, working with the space, the designer cleverly added a bathtub with a shower-head to accommodate for the lack of space. 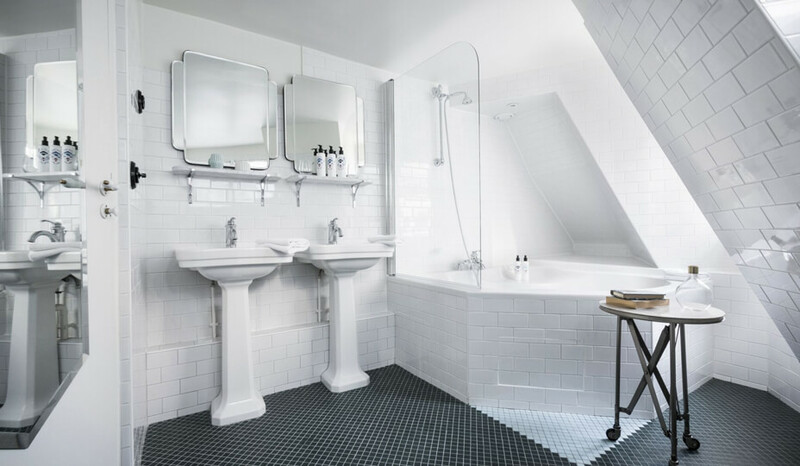 The all white bathroom, with its black flooring is fully functional and quite charming. 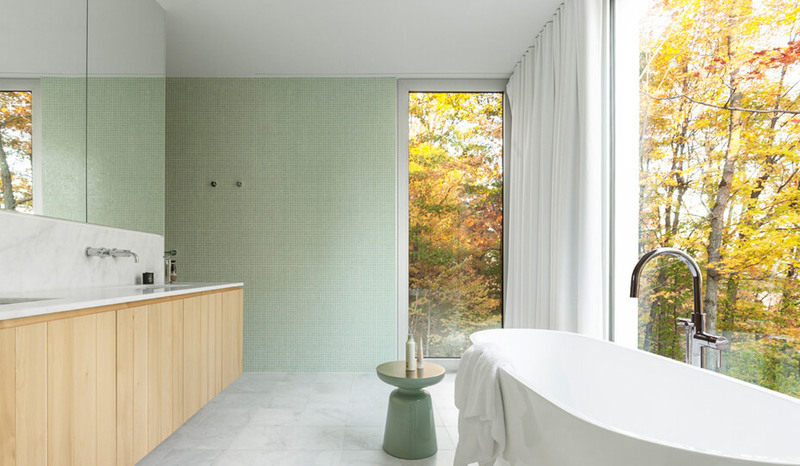 This contemporary bathroom - with its open shower - reminds us of a Japanese design. 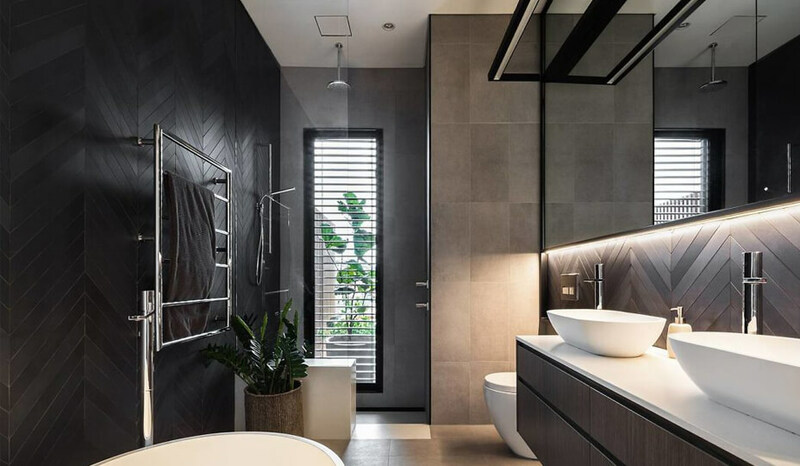 Straight lines, airy feel, use of white and the bamboo accent wall are many design elements that we can find in Japanese style inspired bathrooms. 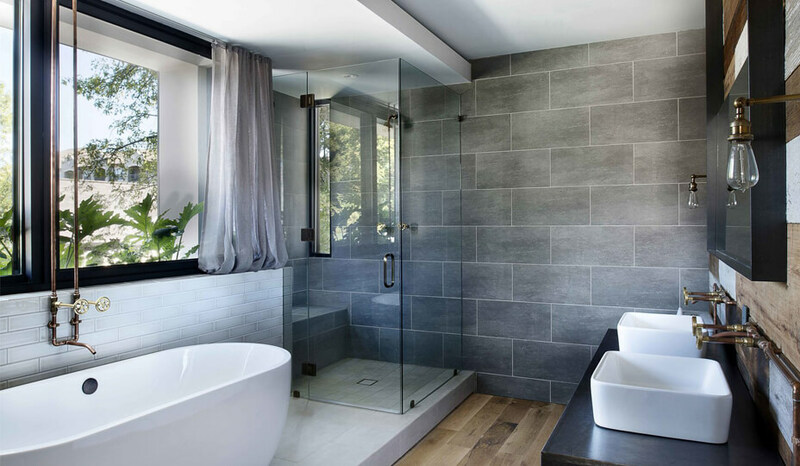 This bathroom is the perfect example of a contemporary remodel in an older house. The architects kept the clawfoot tub as a reminder of the house's past, and the designer added a mid-century light fixture. The various elements in the bathroom remind us many eras. 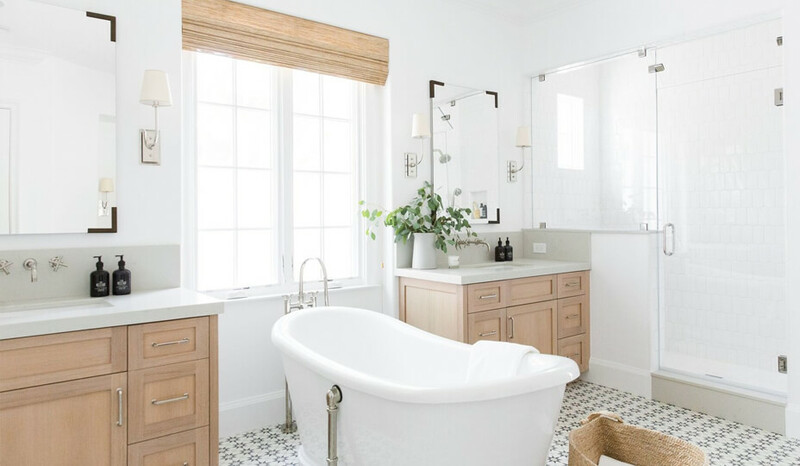 Lots of white, natural fibers and the use of light wood give this bathroom a relaxing and refreshing vibe. 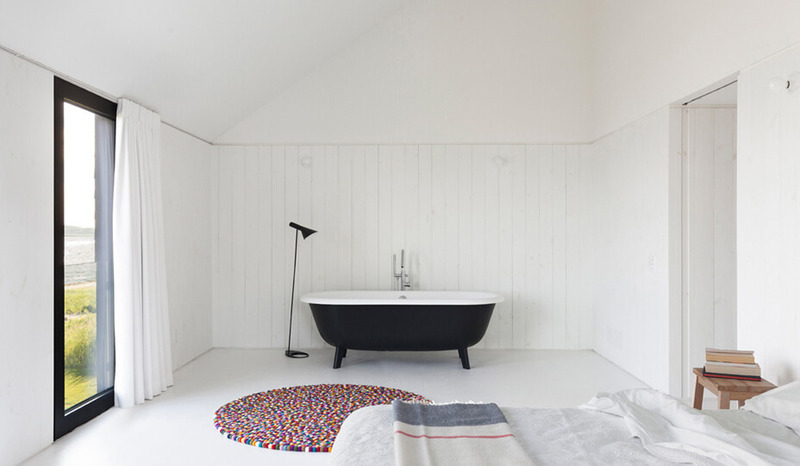 The unusual floor plan with the freestanding bath facing the window provides the room with an original touch. 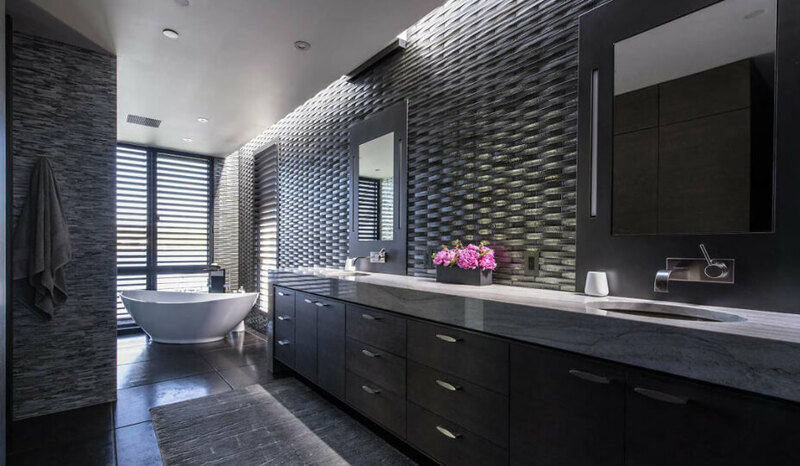 This contemporary bathroom definitely has a masculine look with its black tiles and dark vanity. The shower disappears in the background, making the room seem bigger than it is. Have a small bathroom to decorate? Install some artsy wallpaper to jazz-up the small space! 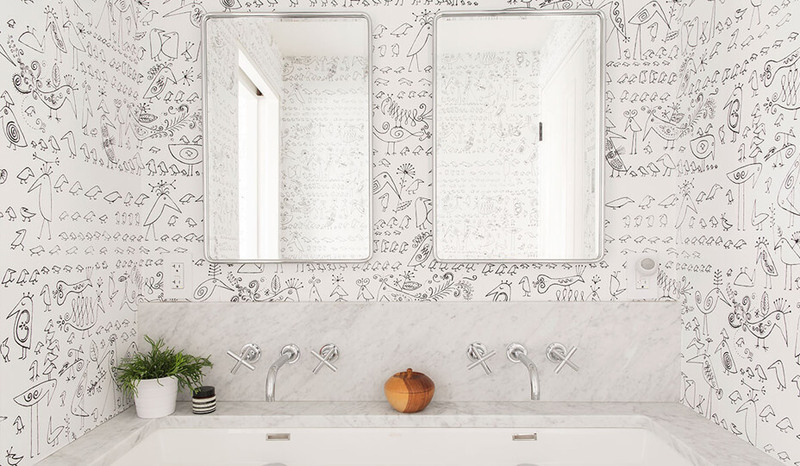 The white background make the bathroom seem spacious, while the black doodles add some fun to the room. When thinking about our dream bathroom, this is what comes to mind! The huge window wall opens to let you enjoy the view and feel like you're taking your bath outside. The rain shower is also tempting with the built-in bench that allows you to sit back and relax while admiring the astonishing view. Isn't it dreamy? This modern bathroom is certainly breath taking with its mix of finishes! 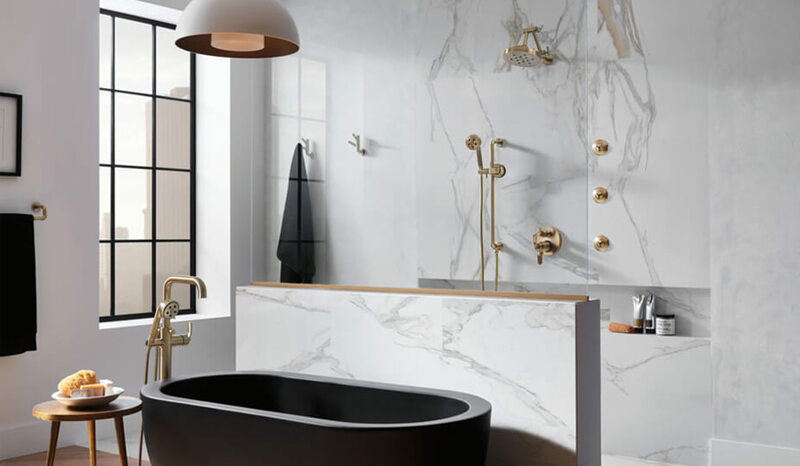 The low-contrast white marble, the dramatic matte black tub, the round-shaped light and the gold fittings are perfectly matched to create a modern look with a retro touch. Black doesn't mean cold & uninviting! This bathroom wall is tiled with matte black herringbone tiles, which adds some warmth to room. The lighting above and below the mirrors enhance the features of the contemporary bathroom. Grey isn't dull! 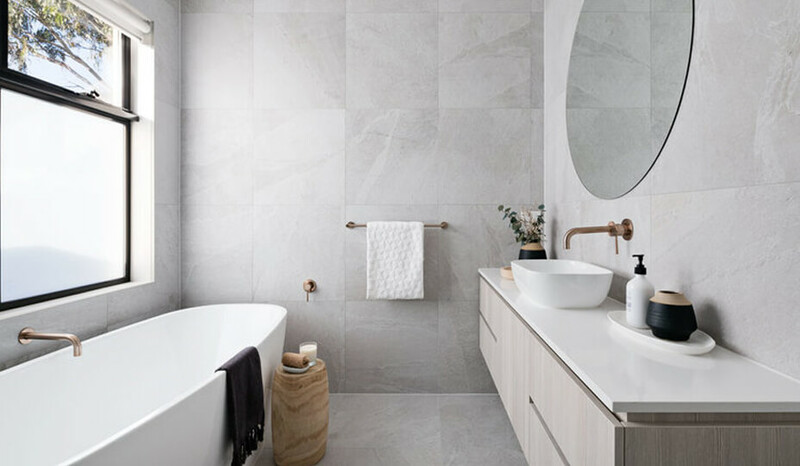 This bathroom is proof that you can use floor-to-ceiling grey tiles and create a stunning room. Certainly relaxing, this bathroom design is timeless. 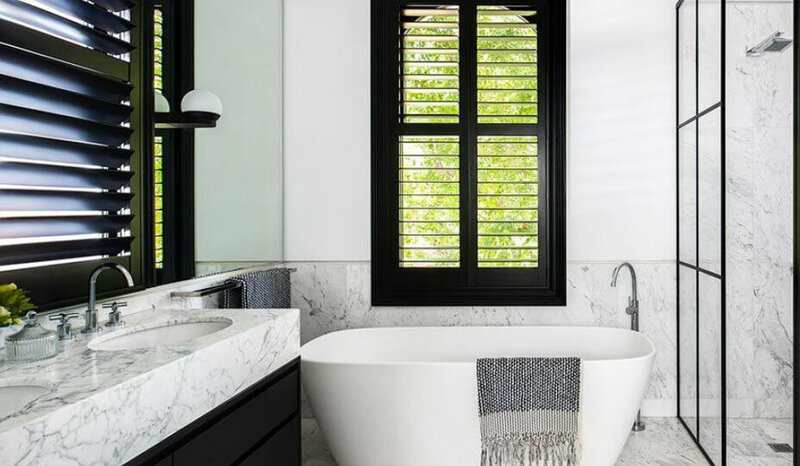 Painting the window frame black makes this bathroom stand out from the rest! The french door-inspired shower enclosures give a modern farmhouse look that won't become dated as time flies by. This bathroom decor make us want to travel to Greece! 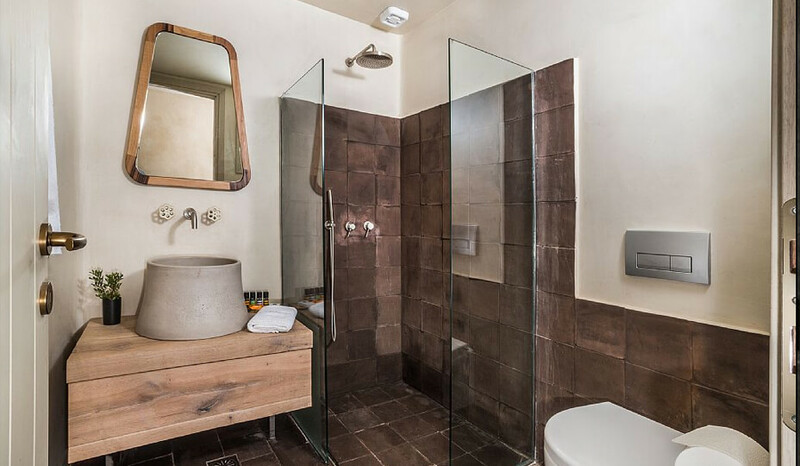 The natural stone-looking ceramic shower walls combined with the wood vanity and the stone faucet confer an authentic Greek style to the room. This bathroom with small mosaic tiles reminds us of mid-century design. The tall vanity mirrors reflect the outside and make the room look bigger. Owners of older homes might want to keep the house looking authentic when undergoing a bathroom remodel. 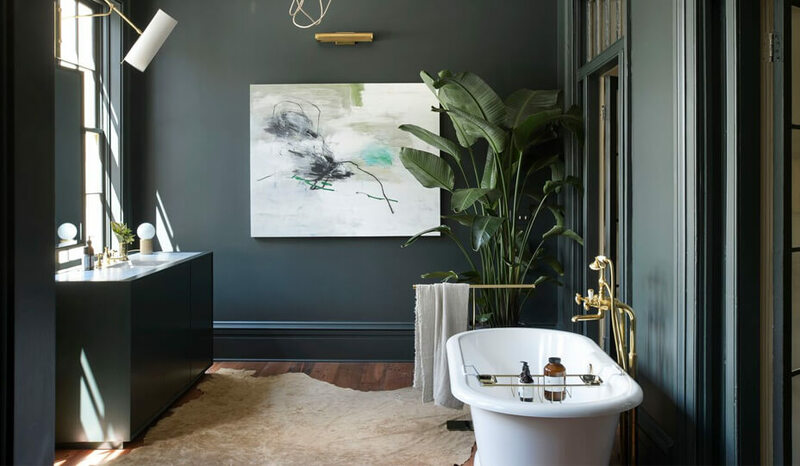 This bathroom is a prime example of a well done Victorian renovation with the use of dark wood and gold fittings. 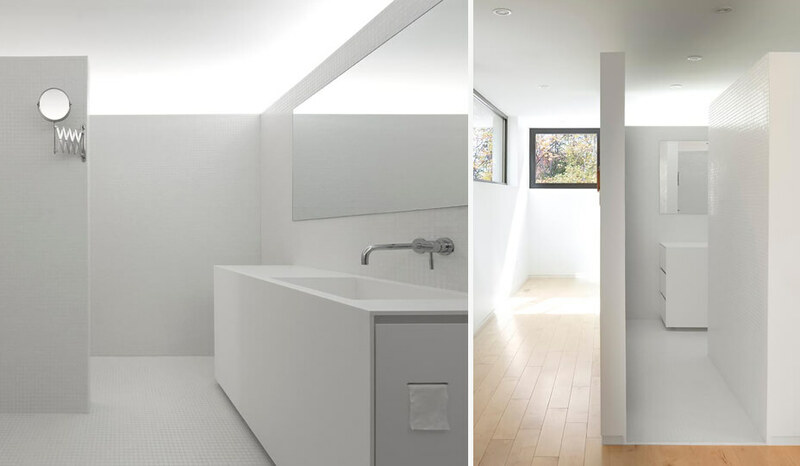 Details are everything in this minimalist bathroom. Everything is set up to draw attention to the greenery, from the wet-room glass separator to the black window frame. 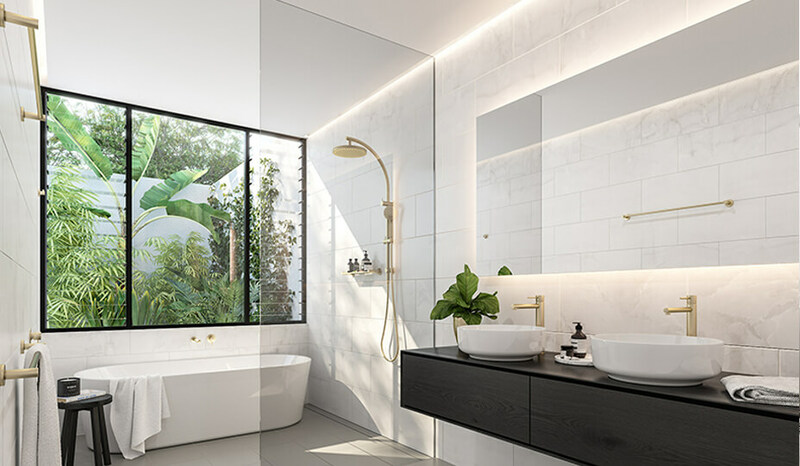 The subtle architectural lighting provides a smart lighting option and brightens up this white, black and gold bathroom. 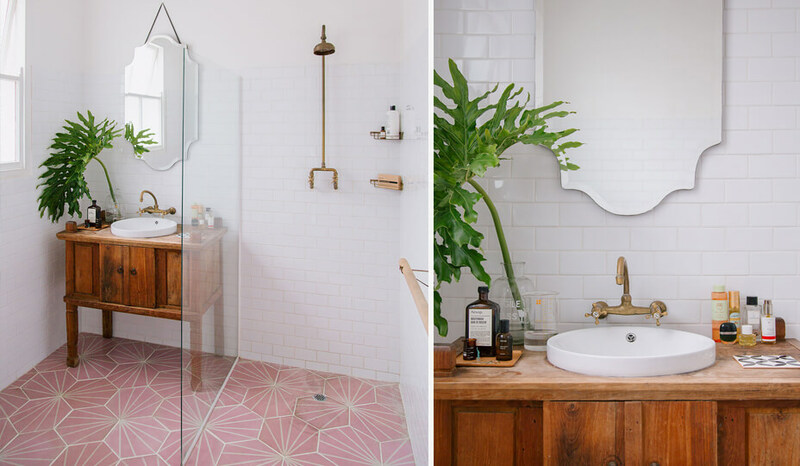 Apothecary themed bathrooms are a massive trend right now. Wondering how to create the style? 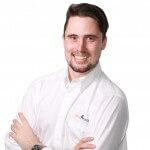 It's all about re-purposing! Use an old mirror instead of the traditional vanity mirror, choose green or soft pink tiles, convert an old furniture piece into a vanity, and last but not least, choose brass fittings. Add some old bottles, a vintage rug and plants to complete the look! 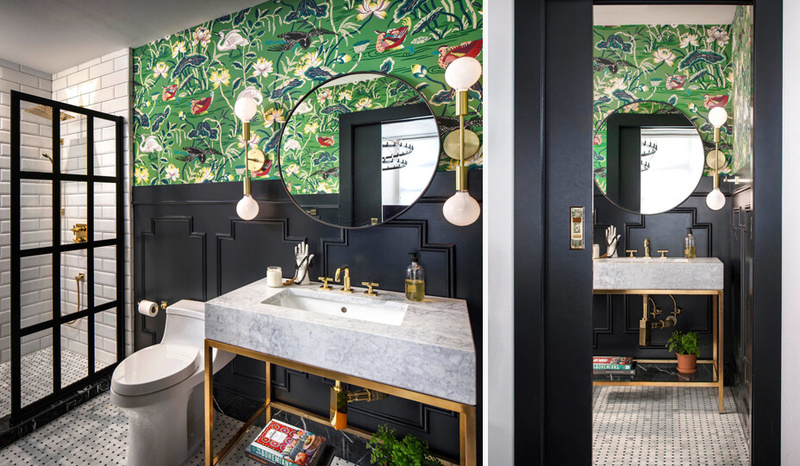 This bathroom's astounding ornamented floor, the detailed molding and the classic light fixtures give off a luxurious vibe. The different shades of white enhance the elegant look to create a dream bathroom you won't want to leave! This grand contemporary bathroom has a unusual shape and layout, with the bathtub standing in the middle of the room. The use of oak on the walls and for the flooring is definitely a sight to see. 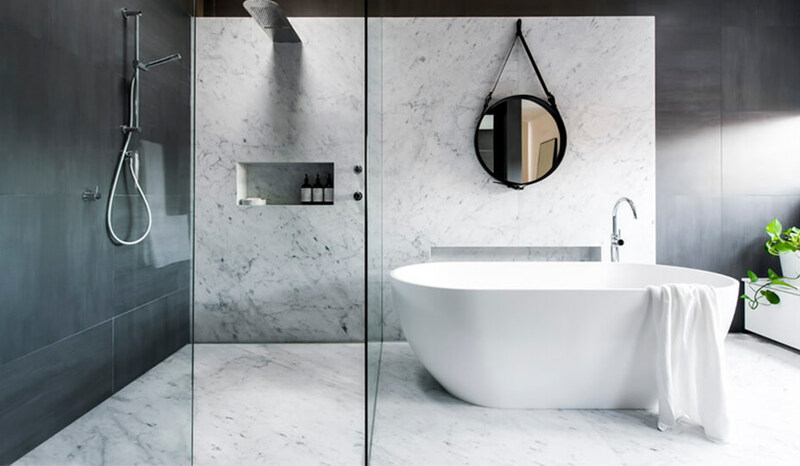 This designer bathroom is a dream come true for marble lovers! They went all out with the marble flooring and the wall covered in marble - all enhanced with black matte fittings! The floating vanity was the perfect choice to complement the modern look. Want to create a bathroom with a spa-feel? Using a cream-coloured palette & combining it with natural materials like stone or wood will definitely get you there. Don't overcrowd the space, only keep the essentials when designing the room. The contrast of the white marble vs the charcoal tiles is spectacular - especially since the white marble seems to be layed over the dark tiling. Although quite modern, this bathroom's look can remain timeless. 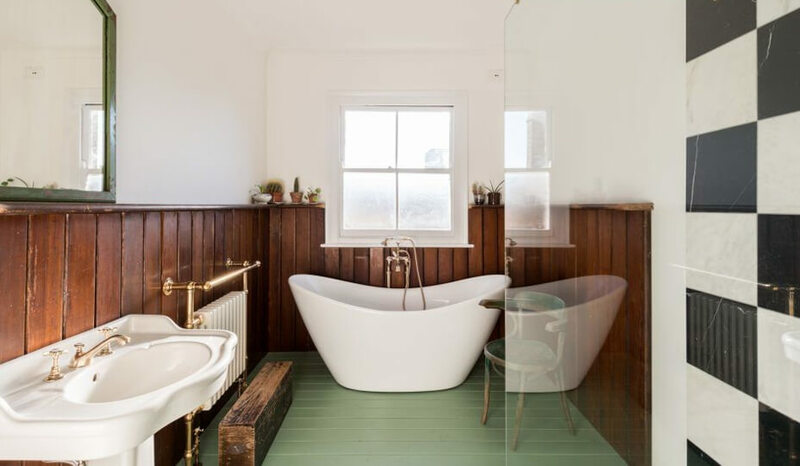 Not only are industrial bathrooms good looking, they are also inexpensive to create: it's all about raw materials. 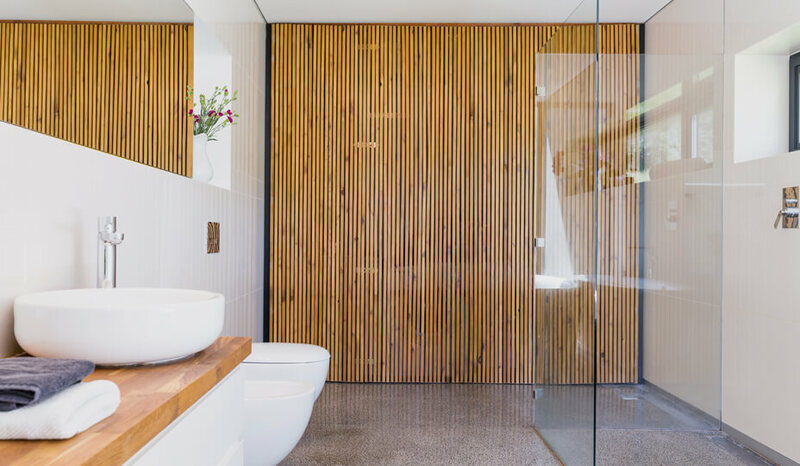 In this bathroom, the exposed plumbing and concrete wall give off the right feel to the bathroom. Looking to design a children's bathroom without over doing it? 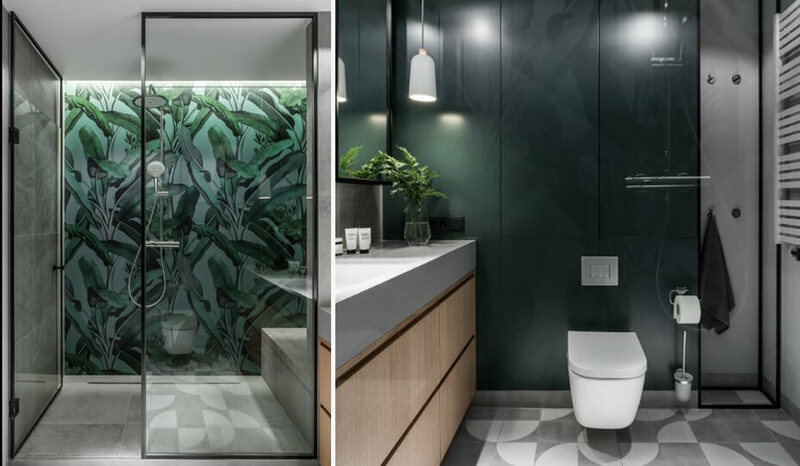 This modern bathroom is a great example you can get inspired from! 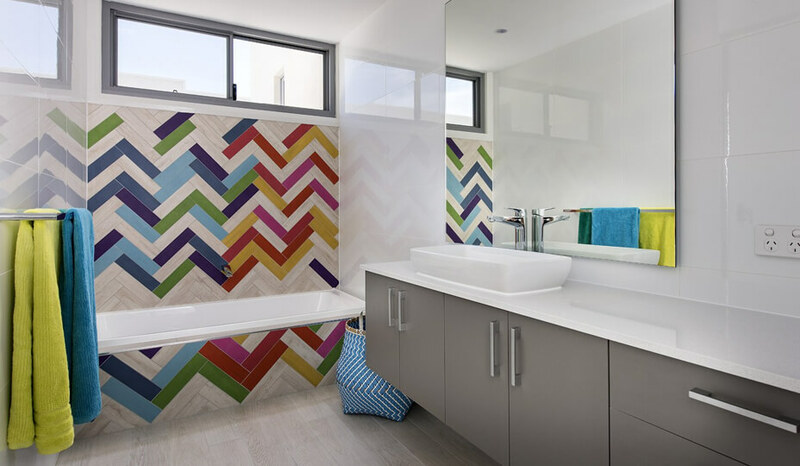 The designer used multiple coloured tiles and laid them in a herringbone pattern. The tiles aren't too 'out there' - allowing the room's decor to remain suitable as the kids get older. A bath in the bedroom? why not!? These homeowners decided to put a clawfoot bathtub directly in the master suite. This solution might not be perfect for your everyday home, but might work perfectly in a cabin or vacation home! 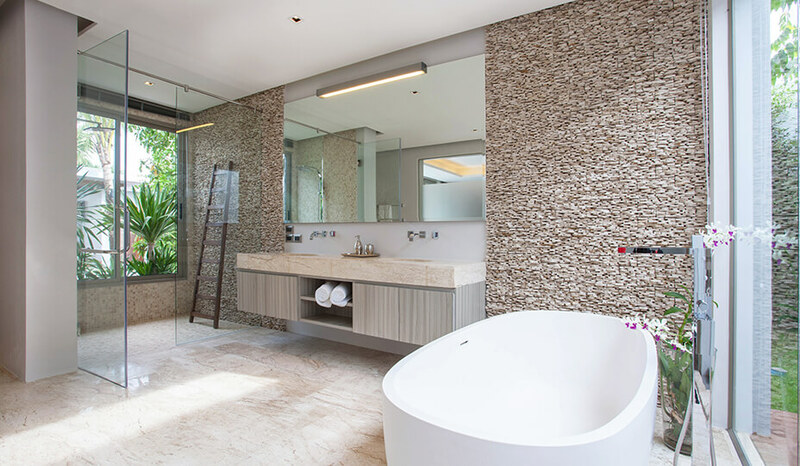 The soft tones used in this contemporary bathroom are perfect to showcase the breathtaking limestone bathtub. 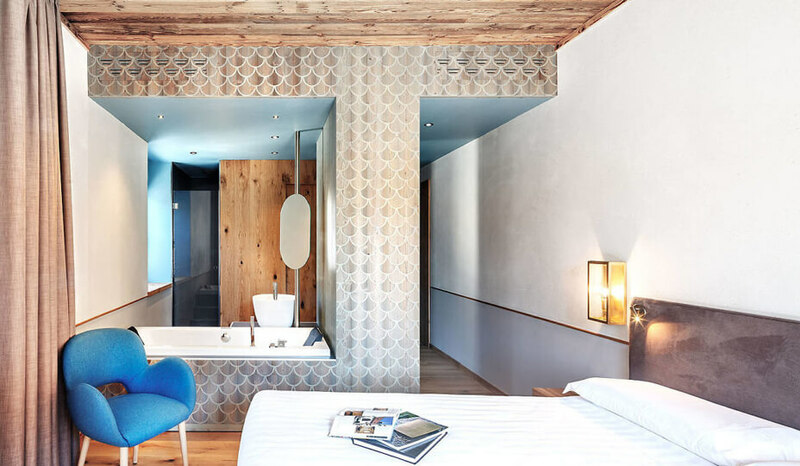 The mix of wood, limestone, natural white tiles all work together to create a dreamy design. When the architecture of the building is stunning, why not showcase it? 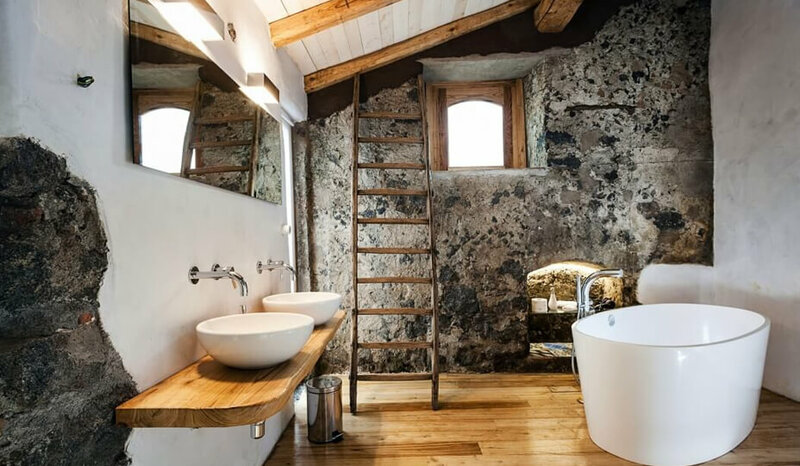 This converted barn brings a rustic feel to the bathroom, contrasting nicely with the modern bathtub, sink and light fixtures. 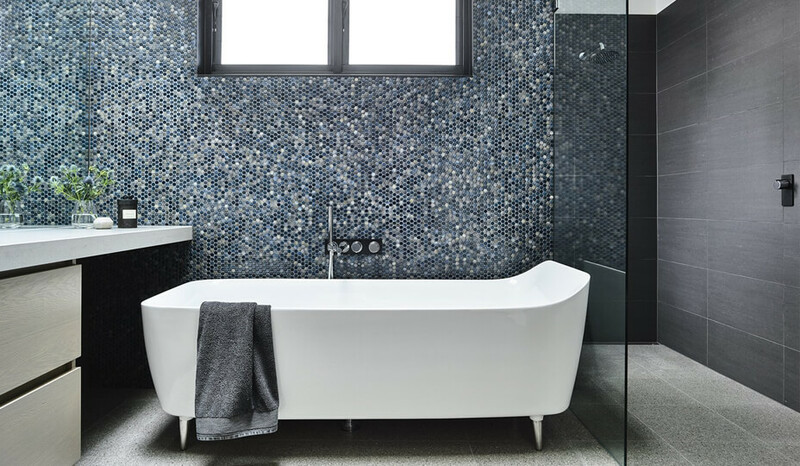 The combo of blue mosaic tiles, large charcoal tiles, grey terrazzo flooring and a black window frame create a masculine feel in this bathroom. The freestanding bathtub with the uncommon square shape complement the look. This ultra contemporary bedroom features a bathroom right in the middle of the room. 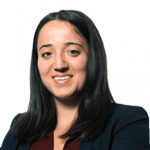 How did the bathroom designers make it work? They created a walk-in bathroom! No need to put a door, nor ceiling-high walls. 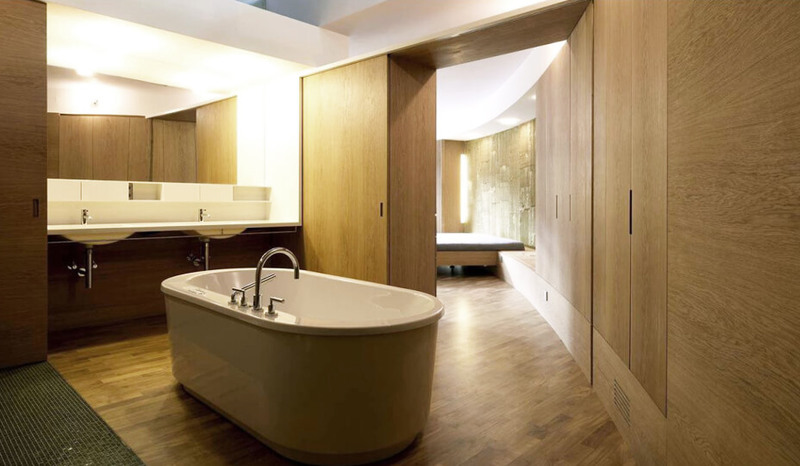 The Advantage: the bathroom is seamlessly integrated & natural light bathes both the bathroom and the bedroom. They say put a mirror to make a room feel bigger, well what about a silver bath? The reflection definitely makes the space feel larger. It also allows the beautiful herringbone pattern of the floor stand out. 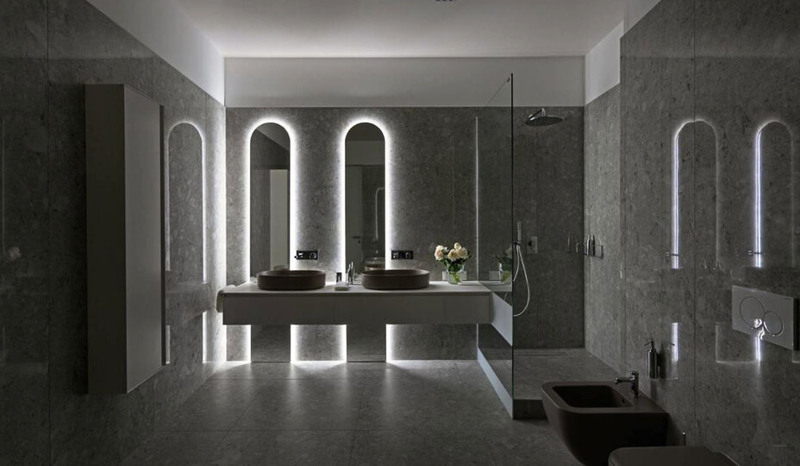 This Italian style bathroom has been revamped to reflect today's style with the use of architectural lighting around the mirrors and its wall to wall terrazzo. Previously seen in governmental institutions like hospitals, schools or offices, terrazzo is now invading our homes for the best! A master suite doesn't need to have a closed-off bathroom. To create a spacious feeling, design the bathroom to be integrated into the decor of the room! This can be done by taking down some walls & simply insuring that the water spaces don't wind up wetting your resting area. Cold weather is when we crave cozy spaces! 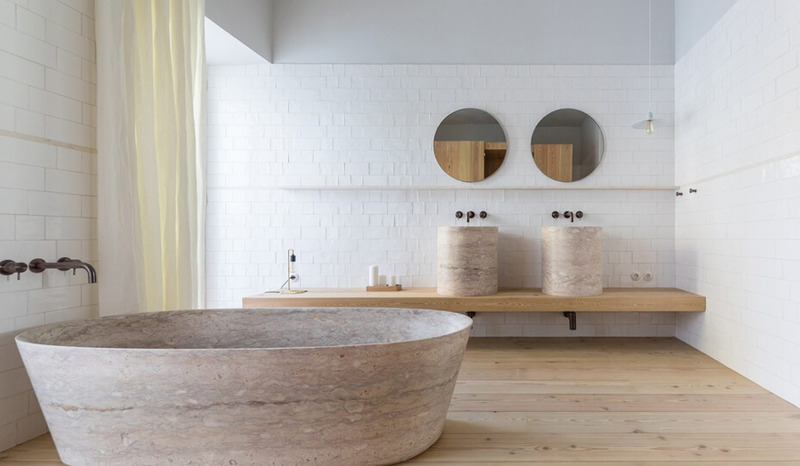 This bathroom is certainly a space that inspire relaxation with the fireplace, the drop-in bath, the sauna and the day bed. The banana leaves backdrop in the shower is definitely a WOW factor! It creates a beautiful, tropical, yet modern feel. The straight lines throughout the rest of the bathroom truly bring together the design - allowing the backdrop to be the focal accent piece. 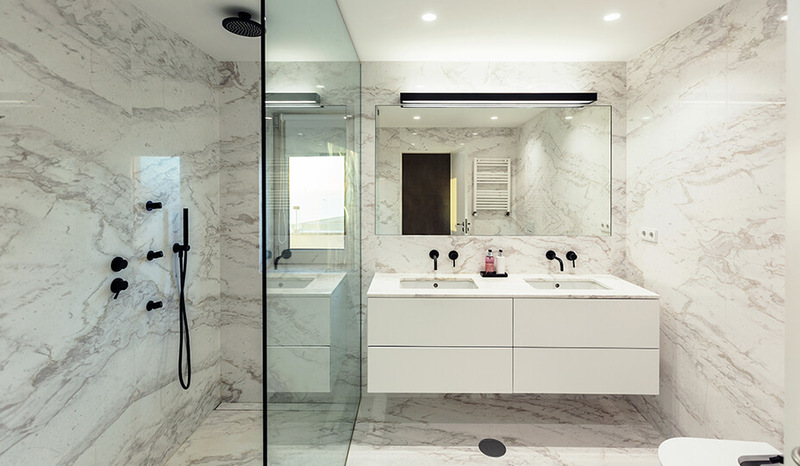 We are used to seeing classic and timeless white marble, but what about cream-coloured marble? With the rise in popularity of matte black fittings, the cream marble has found it's soulmate! They are perfectly paired together and have created a contemporary and feminine design. 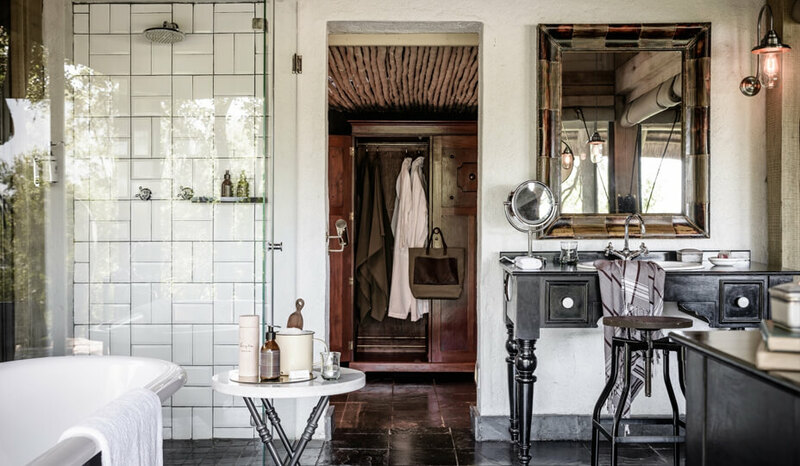 There are plenty of luxurious details in this astonishing bathroom. The tile work looks like a million bucks with its intricate floral inspired arabesque. 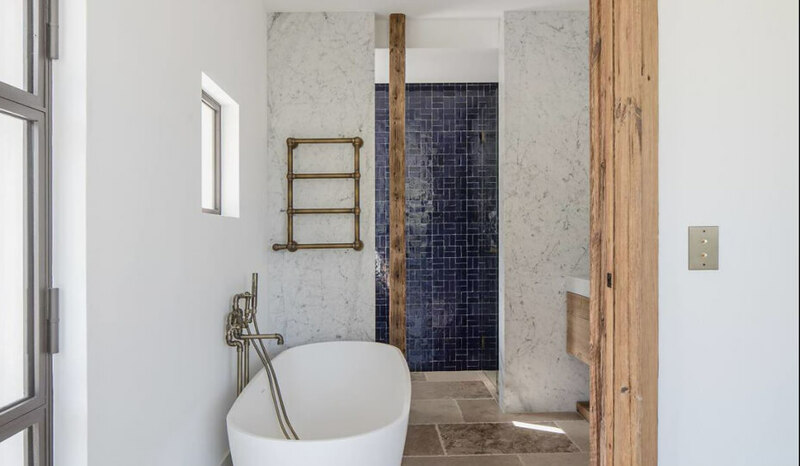 This shower trend is our favourite! The matte black frame is perfect for a small or big bathroom, making the room feel uncluttered. Want to recreate the serenity of your last vacation trip at home? Why not bring paradise to the bathroom? This one's a superb example of a modern design with a hint of Portuguese style. The mix of reclaimed wood and crosshatch patterned blue tiles recall a classic Portuguese look, without overdoing it! Want a simple bathroom that doesn't lack personality? 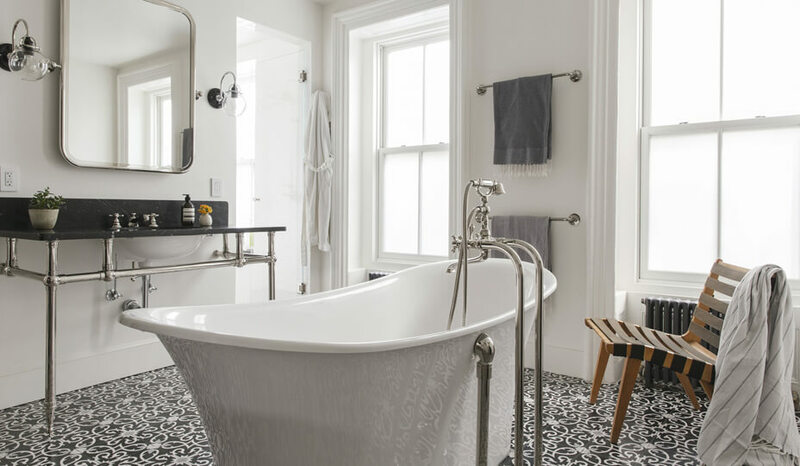 Use bold patterned ceramic tiles as flooring to brighten up the space! The clean layout of this bathroom, with the central freestanding tub also makes it quite special! Who wouldn't like to spend a day in this amazing bathroom? The architecture of the house with the magnificent bay window allows for a one-of-a-kind view while bathing. Looking for help with your bathroom remodel? 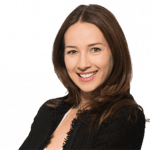 Our Renovation Advisors are highly qualified to help you. 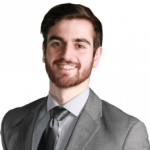 They’ll refer you to up to 3 bathroom contractors, be there to schedule your appointments with contractors, and help you understand every quote you get. 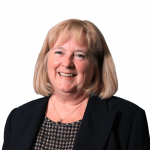 All at no cost, no obligation to you.